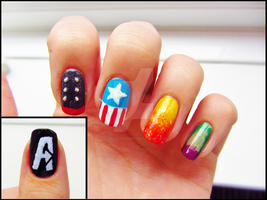 The Avengers Nails With Captain America, Iron Man, Thor, Hawkeye, And The Hulk. Wow they are amazing! I wanna try and do them! you combined shineys and awesome designs! how do I get these for my sister's wedding? Hehe, we should have a nail party! now that is some freaking awesome chiz. Hehe, maybe next time I will include Black Widow! I was just curious about your Thor nail and if it's supposed to be the plated armor on him? Just curious! Heheh~ Actually, the Thor nail is his helmet! I was just curious about the Thor inspired nail, is it supposed to be like his plated armor? Just curious! This is so cool! How long did that take??? They took around 3 hours, I think! np I showed it to my mum who is a nail artist and she said it was incredible work. Hehehe~ awww that is so sweet!! Tell your mom, THANK YOU!! Okay, when it comes to nails I prefer a single smattering of color, but this makes me want to pretty them up Avengers-style SO BAD! XD Really awesome job! !